An abundant food source in a time of food insecurity, just one snag – how can we break the 'yuck' barrier and get insects onto our plates? Insects are high in protein, can be raised with less impact on natural resources than the demands made by conventional farming and in great quantities. But there are no clear regulations in place to get them into our food chain and challenges remain when it comes to uptake – one EU project's findings are helping to construct the bigger picture. Work carried out by the EU-funded PROTEINSECT (Enabling the exploitation of Insects as a Sustainable Source of Protein for Animal Feed and Human Nutrition) project has helped inform a review into the challenge of broadening the appeal, safety and sustainability of insects as food. As the authors of the recently published report in the journal 'Nutritional Bulletin' write, insects have generally high levels of animal protein and key micronutrients with lower environmental footprints than traditional alternatives, and they can be raised on leftovers. But cultural, social and economic hurdles remain. The report establishes the historical significance of entomophagy by humans and key opportunities and hurdles identified by research to date, such as that conducted by PROTEINSECT, paying particular attention to research gaps. The report, described as a narrative review, points out that there are questions surrounding the impact on the insects of the food they are fed and how that could affect their safety as a food source. It considers how to maintain the benefits to the environment of breeding insects even if their production is scaled up. It also highlights the need for future research to establish clear processing and storage methodology, define rearing practices and implement regulations with regard to food and feed safety. It sets out the barriers to the widespread implementation of entomophagy and the steps necessary to counter them. Entomophagy is not a new thing – there is archaeological evidence demonstrating that humans have evolved as an entomophagous species. The report explains that in parts of Central Africa, at times, up to 50 percent of dietary protein comes from insects, and their market value is higher than many alternative sources of animal protein. 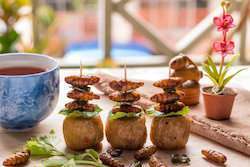 It has been estimated that entomophagy is practiced in at least 113 countries with over 2 000 documented edible insect species and the United Nations has recommended the practice as a potential solution to the shortage of world food supplies. They cite the example of Thailand where, in 1978, a locust (Patanga succincta) outbreak resulted in a government campaign to promote the locust's edibility. This was so successful that the locust became a popular snack and no longer a crop pest. In an interesting reversal, their market value is such that some farmers now grow crops specifically to feed them. But while insects are eaten as part of a daily diet in many countries around the world, the report points out human trials of insect consumption remain a significant research gap, and definitive recommendations regarding insects as nutritionally suitable for humans currently cannot be made. Insects, high in nutrients, have a low environmental impact, require less space and are already part of the natural diets of pigs, poultry and fish. The report cites research showing that incorporating insects into broiler poultry feeds seems to result in no reduction in growth rates and in some cases increased chick growth rates. Replacement of soya bean oil with black soldier fly larvae has been shown to have no influence on growth or performance of broiler chickens, suggesting it is a viable alternative. A key benefit however, would be replacing the fishmeal and oil that is used in animal food with insectmeal, so taking the pressure off ocean fishstocks which are being depleted by overfishing to provide animal feed. PROTEINSECT (Enabling the exploitation of Insects as a Sustainable Source of Protein for Animal Feed and Human Nutrition) ended in 2016. The consortium's aim was to facilitate the exploitation of insects as an alternative protein source for animal and human nutrition. The article appearing in 'Nutritional Bulletin', titled 'Opportunities and hurdles of edible insects for food and feed', drew on PROTEINSECT's findings that 66 percent of consumers questioned consider fly larvae as suitable feedstuff, over 80 percent want to know more about insects as feed, and 75 percent were happy to eat animals fed on insects.